I don’t usually name my recipes after me but calling this “Lucy’s” vegetarian paella is my acknowledgement that this is in no way an authentic recipe and is my interpretation of a paella-like dish. It was inspired by a recent visit to Spain and the home of paella, Valencia. Towards the end of April I spent 5 days in Spain visiting my auntie and uncle with my mum. They live in the countryside just North of Valencia. I never think of Spain as a particularly vegetarian-friendly country but there are some very good vegetarian restaurants in Valencia. 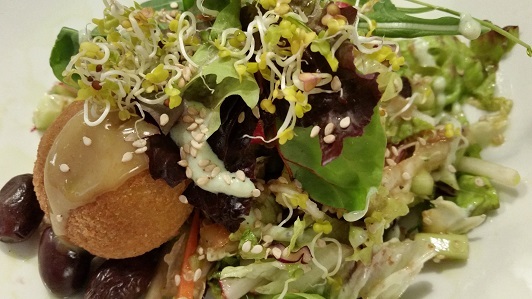 Last time we visited we went to the excellent Ana Eva; this time we tried the oldest vegetarian restaurant in Valencia, Restaurante Les Maduixes. It’s on a fairly unprepossessing street with nothing much of note around it but once you go through the doors it’s lovely. We went at lunchtime when there is a set 3-course menu with two choices at each course, so between us we tried everything and nothing disappointed. Since I’d left my partner at home while I went gallivanting in Spain I thought the least I could do on my return was cook him a paella. 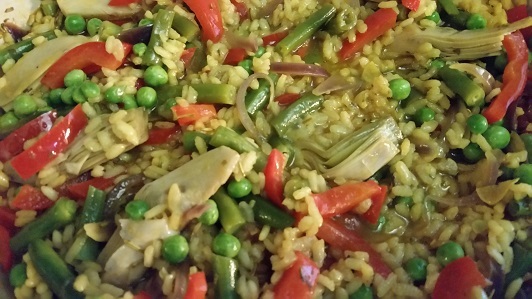 I have made paella in the past but it was from quite an involved recipe so I really wanted to come up with a version that was simple enough to add into my standard repertoire. The second time I made this I sprinkled it with toasted pine nuts and that was really good but I think toasted flaked almonds would work as well. I’ll try that next time. Warm the olive oil in a paella pan or a large flat pan with a lid. Gently fry the red onion, garlic and red pepper for about 5 minutes to soften. Add the turmeric and smoked paprika and fry for another minute or two stirring well. Stir in the rice and rosemary. Add the vegetable stock and green beans and bring to the boil. Turn the heat down and simmer very gently for 30-40 minutes with the lid on until the rice is almost cooked. You can add a little extra water if necessary. Avoid stirring the paella while it's cooking. In the meantime you can toast the pine nuts in a dry frying pan over a medium heat. They only take a couple of minutes so keep shaking the pan and keep an eye on them so they don't burn. Once the rice is just cooked, stir in the peas and artichokes and cook for another couple of minutes to heat them through. Sprinkled with the toasted pine nuts to serve.